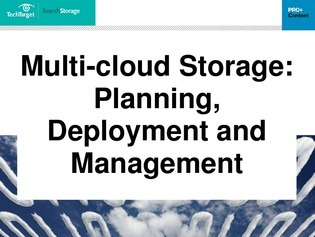 While increasing costs, data security, and vendor lock-in are prevalent concerns organizations have about cloud services, multi-cloud storage can actually help address these issues—and the benefits of the multi-cloud don’t stop there. From planning your multi-cloud environment to deployment, management, and data protection, this 3-part e-book has you covered for every phase of your multi-cloud journey. Inside, you’ll get guidance from SearchStorage.com contributors and industry experts alike, as they illustrate when and where multi-cloud makes sense, the pros and cons of deployment, storage strategies, and management tools to keep an eye on.